Well before the turn; check all around to make sure it is safe to carry out the turn. 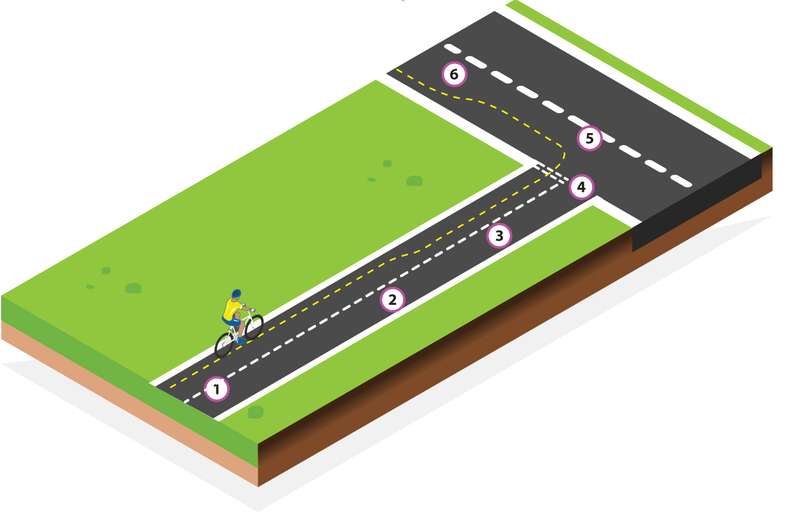 If safe, move from the secondary riding position to the primary riding position to block your lane and control traffic. Give a good left hand signal if you need to let other road users know what you are doing. It should be long enough to make sure people see the signal. Adjust your speed if you need to. Make sure both hands are back on the handlebars for the turn, fingers covering both brakes. Check back over your left shoulder to make sure it is safe to make the turn, if safe, make a controlled turn. As you turn into the minor road, stay in the primary position until it is safe to return to the secondary position. Look all around to make sure it is safe to carry out the turn. Move from the secondary riding position to the primary riding position if safe to do so. Signal left if you need to. The signal should be long enough, so that other road users have a good chance of seeing the signal. Make sure both hands are back on the handlebars with your fingers covering the brake levers well before the junction. Begin slowing down. Keep an eye out for traffic that may be turning in to your road, in case they try to ‘cut the corner’ and put you in danger. Be prepared to move back to the secondary position or emergency stop if necessary. If it is a ‘give way’ line (a solid continuous yellow line in Jersey a double white dotted line in the UK) at the end of the side road and you are able to easily see if it is safe to make the turn safely, there is no need to stop. If traffic is coming and it would be dangerous to turn, come to a controlled stop in good time behind the give way line.If there is a STOP line (a continuous solid white line across the road) at the end of the side road, you must stop to check the road for safety. Set your pedal to the 2 o’clock position and when safe ride out into the road. Ride into the primary riding position on the main road. When safe return to the secondary position. The right hand turns can be dangerous and difficult even for experienced cyclists. 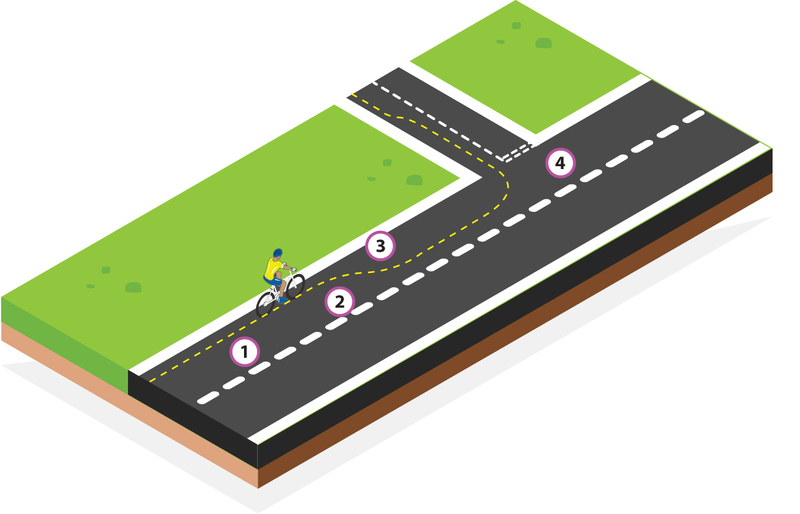 If the road seems too dangerous for you to ride the right hand turn, there is no shame in coming to a stop and pushing your bike across the road. Below is the safest way of doing it. When getting on and off your bike or wheeling your bike, make sure you do this on the pavement. Never stand in the road to do this. Well before you get to the junction, carry out the stopping procedure and dismount so you are not in the way of turning traffic. Wheel your bike down the pavement and turn left into the main road. Walk along the pavement to a safe place not too close to the junction. Using the Green Cross Code, cross the road to the other side. 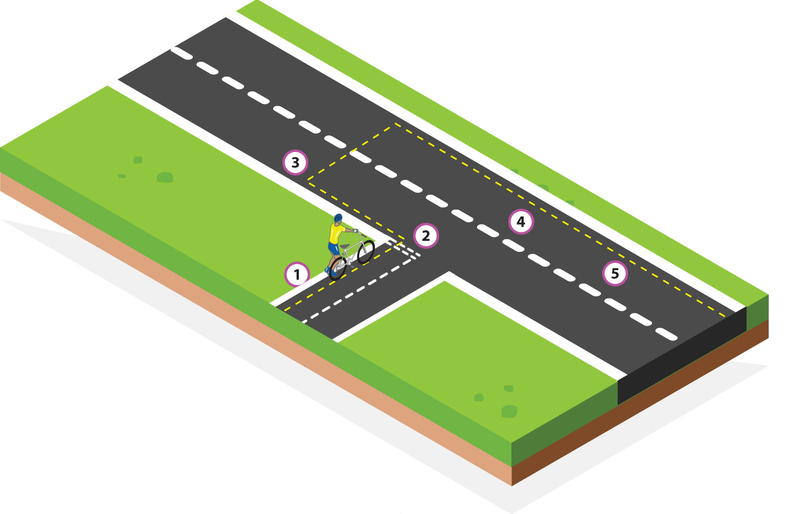 Once across the road, wheel your bike back past the junction to a safe place. Get back on your bike and carry out the starting procedure. 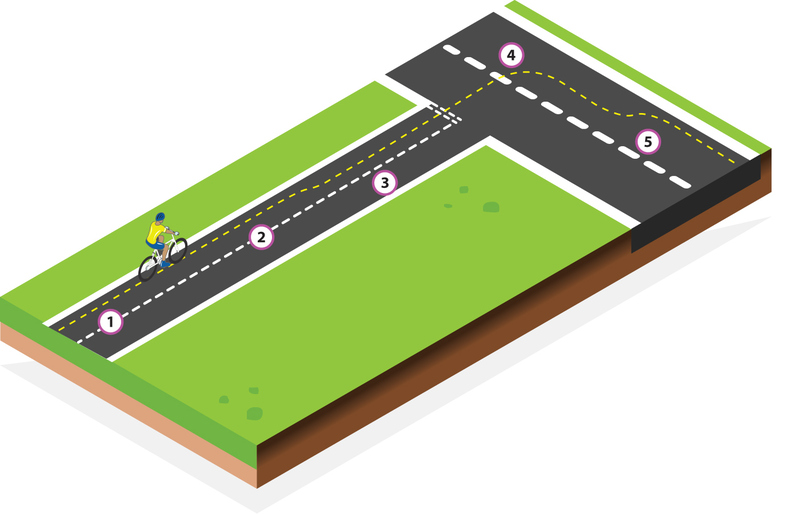 Ride well past the junction to a safe place and carry out the stopping procedure. Get off your bike onto the pavement. Find a safe place to cross the road and use the Green Cross Code to cross the road safely to the other side. 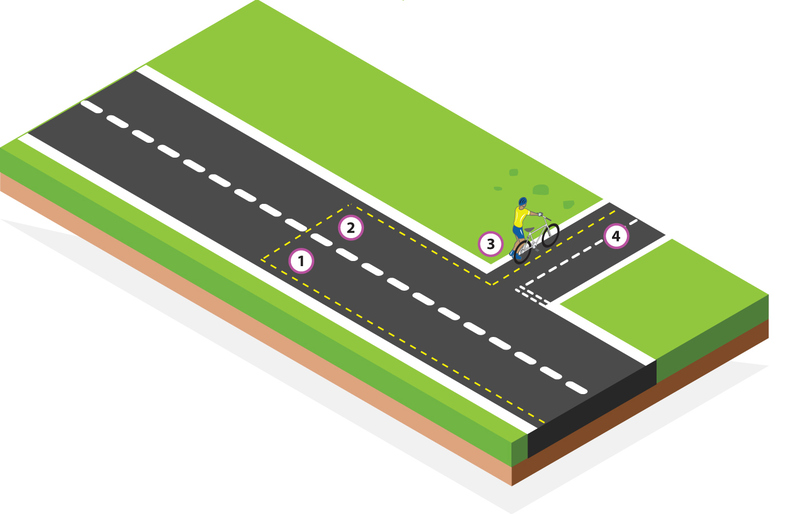 Wheel your bike along the pavement and turn into the side road. 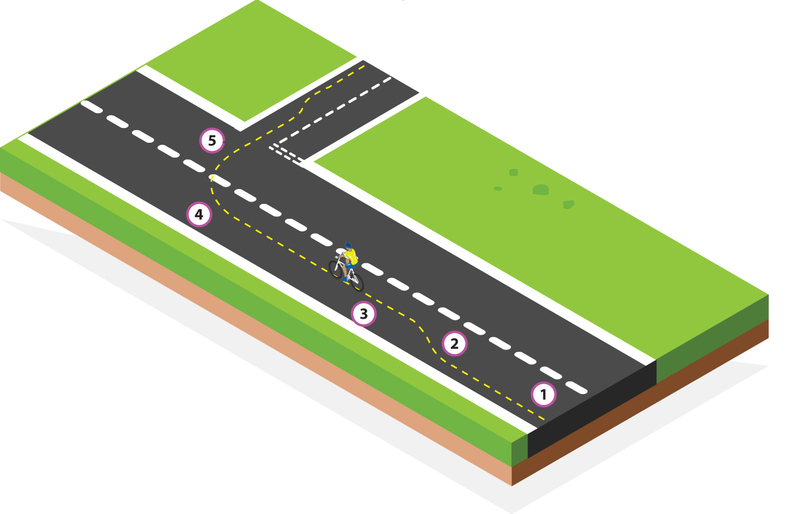 When you are a safe distance away from the junction, get back on your bike and carry out the starting procedure. Well before the junction look back and all around to see if it’s safe to carry out this turn. Look back again to ensure it is safe to move to the primary riding position. If safe, gradually move from the secondary riding position to the primary riding position. When in the primary position and if you need to, give a clear right hand signal to inform other road users of your intention to turn right. Then replace your hand back on the handle bars, fingers covering the brake levers and begin to slow down. Keep an eye out for traffic that may ‘cut the corner’ when turning into your road. As you approach the give way line, if you can clearly see the road is clear, you can ride out onto the main road and make your turn. However, if you don’t have a clear view of the road, you should come to a stop to check if it is safe to turn into the road. Set your pedal ready to go. If you are approaching a solid white stop line you must stop here. Have a good look ALL around, including behind you. When it is safe, ride ‘straight’ out into the road. Make sure you don’t cut the corner, if you do, it places you in danger for longer. Begin the turn when you get to the opposite side of the road. Take up the primary position look back over both shoulders and when safe gradually move to the secondary position. This turn is probably the most dangerous of the turns you are learning at level two. If you have any doubt, if it seems too dangerous to carry out this turn, then don’t do it. Use the alternative method of walking with your bike. There is no shame in this, sometimes it’s just the best thing to do. Well before the junction look all around including behind you to see if it’s safe to carry out this turn. If it looks safe begin moving from the secondary riding position to the primary riding position to block your land and control traffic that may be coming from behind. If there is traffic or people near who need to know what you are doing, give a clear right hand signal that is long enough for them to see. Then put your hand back on the handle bars, fingers covering the brake levers and begin to slow down. Well before you get to the side road; start to look ahead for any traffic coming toward you. If there is traffic coming toward you, you have to make a decision whether it is safe for you to turn in front of the traffic or whether you will have to stop to let them go. This can be very difficult judging a cars speed and how far away they are. If you are in doubt, play it safe and stop. If you do have to stop, you should stop in the primary position blocking the lane to traffic behind you, do not try and go back to the pavement, this can be very dangerous. Whether you have to stop to let traffic pass or you keep going because it is safe, before making your turn, have a good look all around including over your right shoulder to make sure traffic is not trying to overtake you. Take care not to ‘cut the corner’ when you turn, take up the primary position on the side road. Look back over both shoulders and when safe move back to the secondary position.